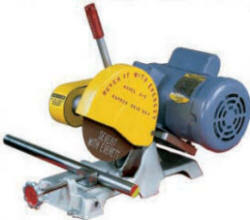 We have a large selection of abrasive cut-off wheels that can be used on Everett saws. Our wheels are made in our U.S. factory from the finest abrasive grains, resins, and fiberglass reinforcement. Wheels for Everett saws are shown on this page as well as on the pages for 6" to 10" wheels and 12" to 20" wheels. If you do not see the wheel you need please contact us, as we have hundreds of other specifications and sizes. Everett saw have 1/2" arbors in 7" and 8" size, 5/8" arbors in the 10" size, and 1" arbor for wheels larger than 10" diameter. Listed below are wheels with the correct arbor hole for Everett saws. See the expanded page for 6" to 10" wheels for more sizes. Listed below are wheels with the correct arbor hole for Everett saws. See the expanded page for 12" to 20" wheels for more sizes.